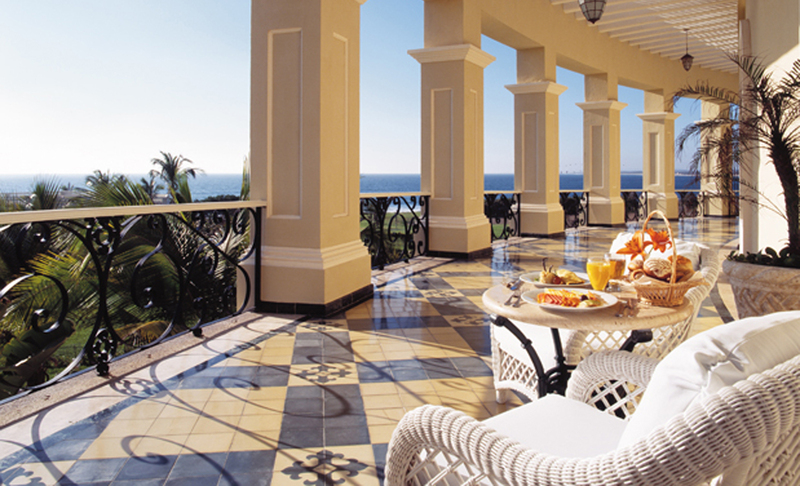 We’re thrilled to be giving away The Pueblo Bonito Emerald Bay Resort & Spa Family Getaway. This incredible prize is for a three-night stay in a Junior Suite for two adults and two children at The Pueblo Bonito Emerald Bay Resort & Spa in Mexico, a resort that made Conde Nast Traveler’s Gold List 2012 and ranked as one of the best places to stay in the world. This remarkable prize is worth $895. 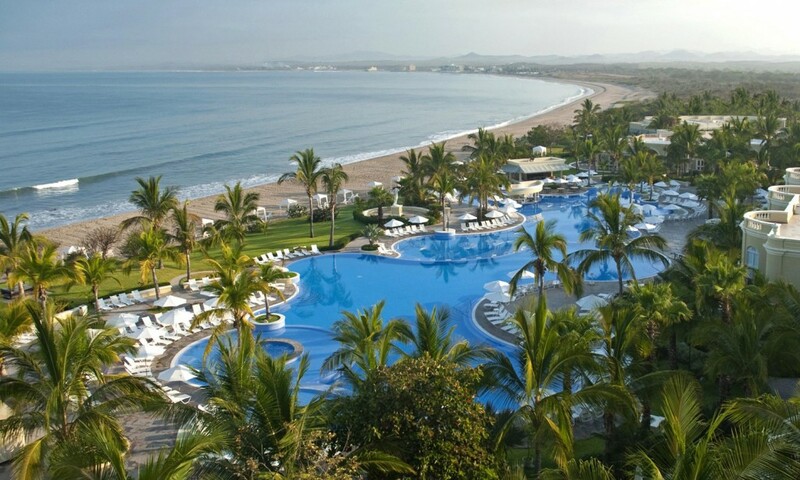 Pueblo Bonito Emerald Bay Resort & Spa is a Conde Nast Award winner as one of the “Top 20 Resorts in Mexico.” The very private and secluded Pueblo Bonito Emerald Bay Resort & Spa sits in an exclusive area known as New Mazatlan. This elegant resort is set on 20 pristine acres overlooking the Pacific Ocean and its own private beach. The resort’s new Bistro open kitchen themed restaurant and sushi bar “will open your eyes to a new dining experience in Mazatlan.” As a guest, you can unwind in your condo-style suite with a panoramic ocean view or choose from an abundance of outdoor activities for the whole family. Pueblo Bonito’s “Luxury without Limitations” all-inclusive plan is now available, which features a wide array of beverages and world-class dining. The giveaway, which runs from May 2 to June 2, 2012, is for The Pueblo Bonito Emerald Bay Resort & Spa Family Getaway. The prize is for a three (3) night stay in a Junior Suite for two (2) adults and two (2) children (age 12 and under). It also includes one full day of the resort’s Kids Club for up to two children. 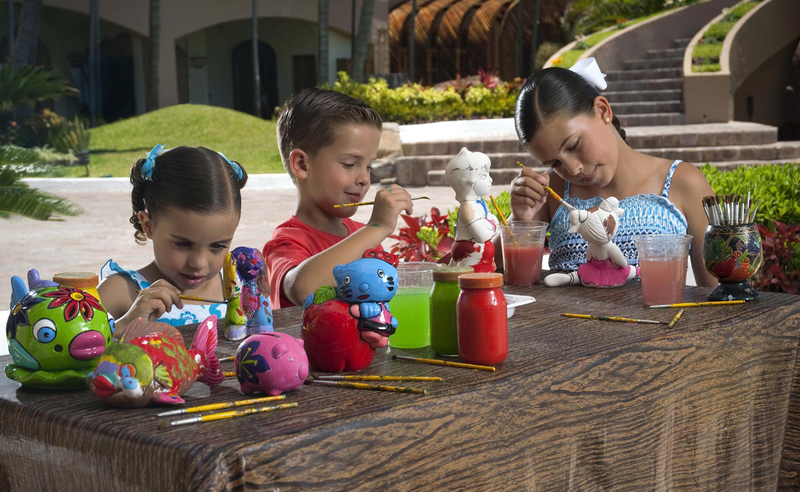 The Kids Club provides activities for children, including arts & crafts, board games, pool games, movies and more, for kids ages 4 to 11. The prize will be valid for one year from August 1, 2012. Upgrades and the resort’s all-inclusive plan may be added to the winner’s stay, but will carry an additional charge. The prize is based on availability. Major holidays are excluded and additional blackout dates may apply. Airfare is not included. The certificate is nontransferable and there is no extension on the expiration date. The cash value of the prize is approximately $895. So enter daily for a chance to win The Pueblo Bonito Emerald Bay Resort & Spa Family Getaway! For a chance to win the The Pueblo Bonito Emerald Bay Resort & Spa Family Getaway, just fill out the form below. Multiple entries are welcome, so come back and enter once a day through June 2, 2012. Complete rules are below. The winner will be notified by e-mail on or about June 17, 2012. Important: Please adjust your spam filter to enable receipt of e-mails with the domain EverettPottersTravelReport.com, so that we can notify you if you’re a winner of The Pueblo Bonito Emerald Bay Resort & Spa Family Getaway. Good luck! Register for a chance to win The Pueblo Bonito Emerald Bay Resort & Spa Family Getaway. By entering, you agree to opt-in for weekly emails from Everett Potter’s Travel Report and occasional emails with information on special offers, promotions and news from Pueblo Bonito Resorts. To enter, you must be at least 21 years old and a legal resident of the 50 United States, the District of Columbia, or Canada. COMPLETE RULES: The Pueblo Bonito Emerald Bay Resort & Spa Family Getaway. 1. How to Enter. Between 9:00am Eastern Time (“ET”) on May 2, 2012and 11:59pm ET on June 2, 2012, (the “Giveaway Period”), you may log onto EverettPottersTravelReport.com to enter The Pueblo Bonito Emerald Bay Resort & Spa Family Getaway. To enter, fill out your full name and email on the entry form and click “Submit Now.” Entrants may enter once a day, each day, during the Giveaway Period. All entrants must have a valid e-mail address. No automated entry devices and/or programs permitted. All entries become the sole and exclusive property of EverettPottersTravelReport.com and receipt of entries will not be acknowledged or returned. Delivery of prize will require a street address (no P.O. Boxes) upon winning. EverettPottersTravelReport.com is not responsible for lost, late, illegible, stolen, incomplete, invalid, unintelligible, misdirected, technically corrupted or garbled entries, which will be disqualified, or for problems of any kind whether mechanical, human or electronic. Only fully completed entries are eligible. Proof of submission is not proof of receipt by this web site. United States, the District of Columbia, and Canada who are 21 or older as of date of entry. Proof of age and legal US residency may be required. Void outside of the 50United States, the District of Columbia, and Canada, where prohibited, taxed or restricted by law. Employees and partners of EverettPottersTravelReport.com, Pueblo Bonito Emerald Bay Resort & Spa, its subsidiaries and affiliates, and their immediate families (parents, children, siblings, spouses) or members of the same household (whether related or not) of such employees/partners are not eligible to enter. This Giveaway may only be entered in or from the United States and entries originating from any other jurisdiction are not eligible for entry. You are not authorized to participate in the Giveaway if you are not located within the United States. All federal, state and local laws and regulations apply. 3. Random Drawing/Odds. One (1) winner will be selected in a random drawing from among all eligible entries received during the Giveaway Period. Odds of winning depend on the number of eligible entries received. Drawing will be conducted by EverettPottersTravelReport.com on or about June 17, 2012. By entering the Giveaway, you fully and unconditionally agree to be bound by these official rules (“Complete Rules”) and the decisions of EverettPottersTravelReport.com, which will be final and binding in all matters relating to the Giveaway. 4. Prize. The prize will be given to one (1) winner. 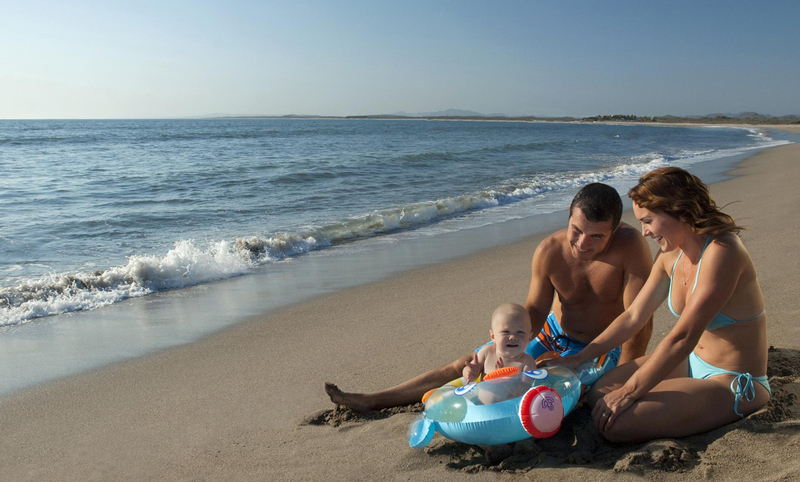 The giveaway, which runs from May 2 to June 2, 2012, is for The Pueblo Bonito Emerald Bay Resort & Spa Family Getaway. The prize is for a three (3) night stay in a Junior Suite for two (2) adults and two (2) children (age 12 and under). It will be valid for one year from August 1, 2012. It also includes one full day of the resort’s Kids Club for up to two children. The Kids Club provides activities for children, including arts & crafts, board games, pool games, movies and more, for kids ages 4 to 11. Upgrades and the resort’s all-inclusive plan may be added to the winner’s stay, but will carry an additional charge. No credit will be extended for unused portion of the package. Package may not be redeemed for cash, resold or transferred. In order to redeem the prize, the winner must contact Pueblo Bonito Emerald Bay Resort & Spa after notification from Everett Potter’s Travel Report. Not to be used in conjunction with any other offer or promotion. Winner will receive a prize email which must be submitted at time of booking or the space is not valid. The letter will contain instructions for redeeming the prize. The prize may not be sold on eBay or any other auction site, nor may it be sold directly to anyone for cash. Otherwise, the offer becomes invalid. 5. Notification. The winner will be notified by e-mail on or about June17, 2012. If the winner does not respond to our e-mailed notification within fourteen (14) calendar days of first notification attempt, if the prize notification is returned as undeliverable, if the winner rejects his/her prize, or in the event of noncompliance with these Complete Rules, such prize will be forfeited and EverettPottersTravelReport.com reserves the right to select an alternate winner from all remaining eligible entries. Upon prize forfeiture, no compensation will be given. 6. Conditions. By entering, you agree to opt-in for weekly emails from Everett Potter’s Travel Report and occasional emails on special offers, promotions and news from Pueblo Bonito Resorts. All federal, state and local taxes are the sole responsibility of the winner. Participation in this Giveaway and acceptance of prize constitutes the winner’s permission for EverettPottersTravelReport.com, and Pueblo Bonito Resort & Spa to use his/her name, address (hometown and state), likeness, photograph, picture, portrait, voice, biographical information and/or any statements made by each winner regarding the Giveaway or EverettPottersTravelReport.com for advertising and promotional purposes without notice or additional compensation, except where prohibited by law. EverettPottersTravelReport.com and Pueblo Bonito Emerald Bay Resort & Spa are not responsible if the prize cannot be awarded due to delays or interruptions due to acts of God, acts of war, natural disasters, weather or acts of terrorism. Entrants who do not comply with these Complete Rules or attempt to interfere with this Giveaway in any way will be disqualified. There is no purchase or sales presentation required to participate. 7. Additional Terms. In case of dispute as to the identity of any entrant, entry will be declared made by the authorized account holder of the e-mail address submitted at time of entry. “Authorized Account Holder” is defined as the natural person who is assigned an e-mail address by an Internet access provider, online service provider, or other organization (e.g., business, educational, institution, etc.) responsible for assigning e-mail addresses or the domain associated with the submitted e-mail address. Any potential winner may be requested to provide EverettPottersTravelReport.com with proof that such winner is the authorized account holder of the e-mail address associated with the winning entry. Any other attempted form of entry is prohibited; no automatic, programmed, robotic or similar means of entry are permitted. EverettPottersTravelReport.com, its affiliates, partners and promotion and advertising agencies are not responsible for technical, hardware, software, telephone or other communications malfunctions, errors or failures of any kind, lost or unavailable network connections, web site, Internet, or ISP availability, unauthorized human intervention, traffic congestion, incomplete or inaccurate capture of entry information (regardless of cause) or failed, incomplete, garbled, jumbled or delayed computer transmissions which may limit one’s ability to enter the Giveaway, including any injury or damage to your or any other person’s computer relating to or resulting from participating in this Giveaway or downloading any materials in this Giveaway. EverettPottersTravelReport.com reserves the right, in its sole discretion, to cancel, terminate, modify, extend or suspend this Giveaway should (in its sole discretion) virus, bugs, non-authorized human intervention, fraud or other causes beyond its control corrupt or affect the administration, security, fairness or proper conduct of this Giveaway or for any other reason EverettPottersTravelReport.com deems it necessary. In such case, EverettPottersTravelReport.com may, at its discretion, select the winner from all eligible entries received unaffected by the problem. EverettPottersTravelReport.com reserves the right, at its sole discretion, to disqualify any individual it finds, in its sole discretion, to be tampering with the entry process or the operation of this Giveaway or web site. EverettPottersTravelReport.com may prohibit an entrant from participating in the Giveaway or winning a prize if, in its sole discretion, it determines that said entrant is attempting to undermine the legitimate operation of this Giveaway by cheating, hacking, deception, or other unfair playing practices (including the use of automated quick entry programs) or intending to annoy, abuse, threaten or harass any other entrants or EverettPottersTravelReport.com representatives. CAUTION: ANY ATTEMPT TO DELIBERATELY DAMAGE ANY WEB SITE OR UNDERMINE THE LEGITIMATE OPERATION OF THE GIVEAWAY MAY BE A VIOLATION OF CRIMINAL AND CIVIL LAWS AND SHOULD SUCH AN ATTEMPT BE MADE, EVERETTPOTTERSTRAVELREPORT.COM RESERVES THE RIGHT TO SEEK DAMAGES FROM THE PERPETRATOR TO THE FULLEST EXTENT PERMITTED BY LAW. THENEW YORKCOURTS (STATE AND FEDERAL) SHALL HAVE SOLE JURISDICTION OF ANY CONTROVERSIES REGARDING THIS GIVEAWAY AND THE LAWS OF THE STATE OFNEW YORKSHALL GOVERN THIS GIVEAWAY. EACH ENTRANT WAIVES ANY AND ALL OBJECTIONS TO AND HEREBY SUBMITS TO THE JURISDICTION AND VENUE OF THESE COURTS. 8. Name of Winner. To obtain the name of the winner, send a self-addressed, stamped envelope by June 20, 2012 to: Everett Potters Travel Report Attn: Pueblo Bonito Emerald Bay Resort & Spa Giveaway Winner, 146 Third Avenue, Pelham, NY 10803. This looks like heaven to me…would like to experience it first-hand. Looks like a beautiful place. Pick me. Cool! Family fun by the ton! How nice this would be! I’m ready!!!! Please pick me !!! This is my kind of place to visit. Would love to win this trip! Now, this is a dream holiday! What a fantastic contest! Thanks! As close to paradise as it gets here on earth. My wedding pictures were taken there. Love the lizzards lounging on the roof. Simply elegant. Love the Italian buffet. You have to see it to believe the beauty of it. Can’t wait to come back to paradise. Even the beautiful pictures can’t do it justice. The people, the amenities, the lush foliage. I definitely need this reward. take me back to my wedding day. No other place on Earth is as beautiful. Looks so beautiful, thanks for the chance to win. Looks beautiful, thanks for the chance to win. So beautiful! My bags are packed! Thanks for the chance to win. What a dream come true..i have always wanted to take my niece and nephew on a vacation..and this would make a awesome gift to them..Thanks for the chance. Please pick me to win! What a beautiful Hotel.